Spoonman Creations, (un)Ltd, Handcrafted WindChimes, Masks, Jewelry & Gifts! Spoon Up Some Sunshine ! ! Easter falls on April 21st this year. Spoonman has table décor and Easter–related items that make appropriate gifts for both men and women. If you haven't had a chance to visit us at Portland Saturday (Sunday too) Market this year...plan an outing to enjoy the beautiful spring we are (FINALLY) having. Ready or Not – Hummingbirds are whizzing about and spring flowers are blossoming! See Spoonman's celebration of spring–inspired items – we've picked a couple dozen or so here to start your adventure. Rain or shine, all of our windchimes (we have over 80 now!) can be enjoyed outdoors as well as inside. 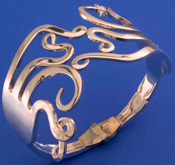 Made from 18–8 stainless or silverplate, both materials are long lasting. And if you are looking forward to being out in the sunshine, you might find you "need" a new windchime to add some shiny new sparkle to the spring weather.